LOVE the prints from Prada for this season, don't love the shapes. Luckily my favourite high street shop has given me options. I have actually tried both of these on, the skirt and the top, on seperate occasions. The shirt is absolutely lovely, but I just don't know how much I would wear it and sadly the skirt (which I adore) is too big on the waist. I really love the more feminine take Zara put on the Prada originals. I love stripes so much, my favorite pattern. 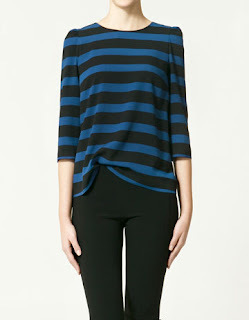 But youre right, Zara did do a better job with the stripes! !